Ram is the 7th incarnation of Vishnu and the central figure of the Ramayana (Ramayan) epic. The Ramayan is the very soul of India. It is a complete guide to God-realization, the path to which lies in righteousness. The ideals of man are beautifully portrayed in it. Everyone should emulate those ideals and grow into ideal human beings and ideal citizens. 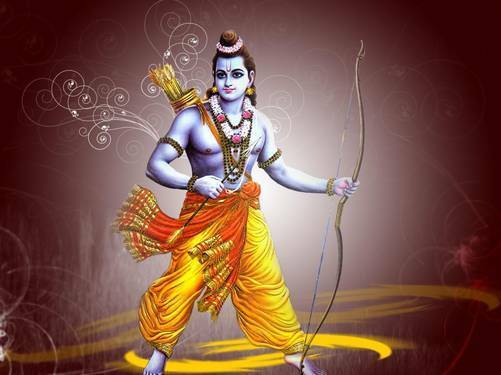 Ram was born as the first son of Dasharatha, king of Ayodhya. Ram’s mother was Kausilya. Ram had three brothers : Bharata (Bharat) born from the second wife Kaikeyi, and Lakshmana (Lakshman) and Shatrughna born from the third wife Sumitra. Later Ram went with Saint Vishwamitr to Mithila where the wise King Janak ruled. King Janak had organized a svayamvaraa (an acient custom wherein the bride chose her husband of her own accord from amongst a number of suitors). It was announced that whosoever will bend the bow of Lord Shiva will marry King Janak’s daughter Sita. Sita was an incarnation of Lakshmi, the consort of Lord Vishnu. But none of the suitors was able to lift Lord Shiva’s bow, except Ram. Ram lifted the bow with his one hand and bended it so hard that it even broke. So Ram got married to Sita, and his brothers got happily married to Sita’s sisters. After returning and living happily in Ayodhya the old King Dashrath decided that it was time to give his kingdom to his beloved son Ram. There Kaikeyi, the third and youngest wife of the King, claimed the throne for her son Bharat. A long time before the young Queen had saved the King’s life and he had promised to fulfill her two wishes. Manthara, the crooked and evil-minded maid-servant of Kaikeyi influenced the queen to claim her wishes now in favor of her son and to request Dashrath to banish Ram from the kingdom for fourteen years, and to install Bharat on the throne instead. The King was shocked, his heart was broken, but he knew that truth is the highest Dharm, and that he had to fulfill his promise to his wife. So Ram went to exile happily, knowing that to obey and serve his father was the highest duty of a son. After Ram left to the forest, Dashrath died from the pangs of separation from his beloved son Ram. Bharat went to the forest to meet his brother Ram and to request him to come back to Ayodhya. When Ram refused to return, in honor of the promise to his father, Bharat took Ram’s “khadau” (wooden sandals) and placed them symbolically on Ayodhya’s throne. Until his brother returned from the exile Bharat served the kingdom as a true and honest caretaker of Ram. Once Surpnakha, the sister of Ravana, passed by the place where Ram was living. She saw Ram and became impressed by his beauty. She transformed herself into a beautiful lady and went to Ram and asked him to marry her. When Ram refused and told her he is already married to Sita, she became angry. Coming back to her original form she ran towards Sita to kill her. When Lakshman saw that he cut her nose and one ear. Surpnakha then send her brother Khardushan with fourteen thousand rakshasas to avenge her. But all were killed by Ram. Surpnakha now sought vengeance through her older brother Ravana, but only got his interest by pointing out that the beautiful Sita would be a fitting wife for him. Ravana lured Ram and Lakshman away from Sita by sending an enchanted deer of extreme beauty and then took Sita to his kingdom of Lanka. On the way, Jatayu, a vulture bird and old friend of Ram’s father Dashrath, fought Ravan but was fatally wounded. He lived only long enough to tell Ram what had happened upon his return. In Lanka, Ravana tried to threathen Sita into marrying him, but was rejected again and again. Meanwhile, Ram made an alliance with the monkey King Sugreeva, who had been exiled from his kingdom by his brother Bali. Ram helped Sugreeva to regain his kingdom and in return Sugreeva raised an army of monkeys and bears, led by Hanuman. When they reached the sea, Hanuman flew across. On the way he had many adventures, which can be found on the Hanuman page. In Lanka, Hanuman promised Sita that help would come soon. When he was then captured by the rakshasas, Ravana ordered them to set fire to Hanuman’s tail, wrapping it with oily rags. But Hanuman increased the length of his tail so much that there seemed no end to it. He escaped and used his burning tail to set fire to all of Lanka. Meanwhile, Ram’s army had build a huge bridge between Lanka and the mainland. They crossed the ocean and attacked Ravana’s army. During the battle, Lakshmana was heavily wounded, but he was cured by a magic herb which Hanuman flew all the way to the Himalayas to obtain. Not finding the herb at first, Hanuman brought the entire mountain just to be sure. This was a moment of great rejoicing. Ram and Sita were finally crowned King and Queen of Ayodhya, though people were doubting that Sita had preserved her virtue while being Ravana’s captive, which is another story in itself.